Bringing technology to cutting boards – Epicurean, Gourmet Series Cutting Boards! Thank you to Epicurean for providing me with a sample to review. I love to cook and with the holidays coming up, I’ll be jumping my kitchen into overdrive! With so many things to bake, cut and create I’ll be needing kitchen items I can count on, especially a cutting board! Thankfully Epicurean has me covered with some of the most advance cutting surfaces on the market. From the use of sustainable “Green” manufacturing practices to the amazing science they put into their cutting surfaces to make sure they are heat and dishwasher resistant, Epicurean is setting the bar for cutting board excellence. The cutting board works great! It’s food safe, resin coating makes the wood resistant to things like cracks, stains and juices soaking in. I love that it can be popped in the dish washer without the worry of it getting ruined. Plus the smooth surface won’t dull my knives. The juice grooves are wonderful when cutting watery veggies or fruits as well as meats with lots of juice. The resin coating also makes the cutting board easy to clean and doesn’t require the use of bleach or oil the board after use. All in all, when it comes to my kitchen needs, the Gourmet Series Cutting Board from Epicurean totally has me covered. I’ve loved using it and can’t wait to see how it stands up to my holiday usage! If you are looking for a great cutting board or the perfect gift for your foodie friends and family, I suggest picking up an Epicurean, Gourmet Series Cutting Board! 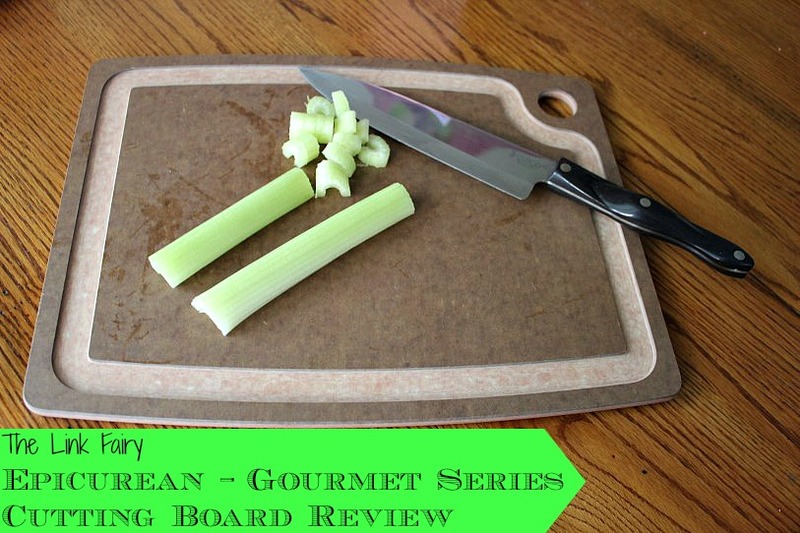 Grab an Epicurean, Gourmet Series Cutting Board on Amazon.com today! Be sure to follow Epicurean on facebook to stay up to date on the latest products and promotions! I need this! I am always ruining my cheap flexible cutting boards by bending them in storage — this one is so stylish! That looks like a great board. It’s really pretty, too! I love that this one has the juice grooves. Looks like an overall good cutting board. I need this! I went to Epicurean and checked out the cutting board and I think I would choose the natural color. My favorite feature is that it is heat resistant up to 350 degrees. I do not have a cutting board that could withstand that much heat. That cutting board is a must! I like the grooves and the fact that it can handle the heat. I also like the fact that it can go in the dishwasher and you don’t need to use bleach or oil.